St. Martin's Griffin, 9780312304683, 288pp. 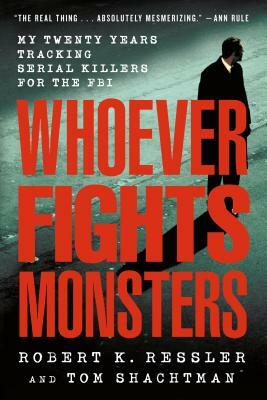 LEARN THE TRUE STORY OF ONE OF THE FBI PROFILERS WHO COINED THE PHRASE "SERIAL KILLER"
Face-to-face with some of America's most terrifying killers, FBI veteran Robert K. Ressler learned how to identify the unknown monsters who walk among us -- and put them behind bars. In Whoever Fights Monsters, Ressler—the inspiration for the character Agent Bill Tench in David Fincher's hit TV show Mindhunter—shows how he was able to track down some of the country's most brutal murderers. Ressler, the FBI Agent and ex-Army CID colonel who advised Thomas Harris on The Silence of the Lambs, used the evidence at a crime scene to put together a psychological profile of the killers. From the victims they choose to the way they kill to the often grotesque souvenirs they take with them—Ressler unlocks the identities of these vicious killers. And with his discovery that serial killers share certain violent behaviors, Ressler goes behind prison walls to hear bizarre first-hand stories from countless convicted murderers, including Ted Bundy, John Wayne Gacy; Edmund Kemper; and Son of Sam. Getting inside the mind of a killer to understand how and why he kills is one of the FBI's most effective ways of helping police bring in killers who are still at large. Join Ressler as he takes you on the hunt for the world's most dangerous psychopaths in this terrifying journey you will not forget. Robert K. Ressler (1937-2013) was a supervisory special agent of the FBI as a reserve colonel in the U.S. Army's Criminal Investigation Division (CID) before retiring. He later served as the director of Forensic Behavioral Services, a business dedicated to training, learning, consulting, and expert witness testimony. He is the author of Whoever Fights Monsters and the inspiration for one of the main characters in the Netflix Original Series Mindhunter. Tom Shachtman is an author, filmmaker, and educator. He has written or co-authored more than thirty books, including Rumspringa, Airlift to America, and Terrors and Marvels, as well documentaries for ABC, CBS, NBC, and PBS, and has taught at major universities. Publishers Weekly lauded his book Rumspringa: To Be or Not to Be Amish as "not only one of the most absorbing books ever written about the Plain People, but a perceptive snapshot of the larger culture in which they live and move." He has written articles for The New York Times, Newsday, Smithsonian, and environmental monthlies, and writes a column for The Lakeville Journal (CT). A two-hour television documentary based on his book Absolute Zero and the Conquest of Cold was broadcast on PBS in February 2008.